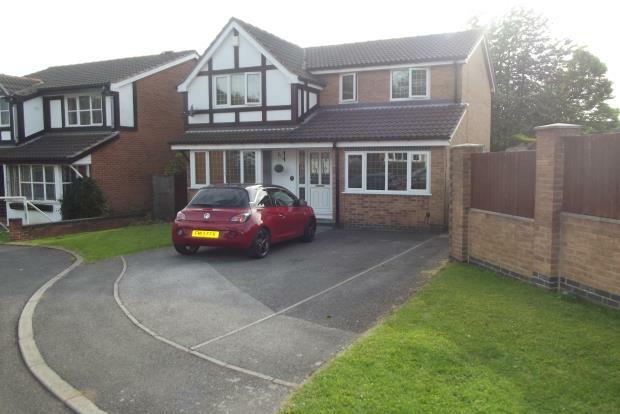 4 Bedroom To Rent in Derby for £1,150 per Calendar Month. The property comprises of three reception rooms, conservatory, large kitchen, utility, WC, four good sized bedrooms, family bathroom and en-suite. On entering this stunning property, is your entrance hallway laid with new, laminate flooring providing you access to two of your reception rooms. To the right is your first reception room laid with new beige carpets, perfect for a study/ second living room or a childrenâ€™s play room. To the left is your main living area of generous size laid with new beige carpet. Following on from your living room is your dining room and conservatory both laid with new laminate flooring. The conservatory over looks the garden, completely enclosed with a shed and patio area. Off the dining room is your large kitchen laid with tiled floor, including a small fridge, integrated dishwasher, gas hob, electric oven and extractor hood. The utility room at the end of the kitchen includes a free standing washing machine. Adjacent is your renovated WC. To the first floor at the top of the stairs is your family bathroom, renovated to a very high standard with panel wall tiles, laminate flooring, WC, wash basin, bath with an electric shower over. All of your bedrooms are of good size laid with new beidge carpets with the master complete with fitted wardrobes and a renovated en-suite, again with panel tiles and laminate flooring. To the front of the property is a good sized drive way with parking for two vehicles, located in Oakwood on a cul de sac this is a great location with excellent transport routes and schools. The property has been renovated throughout to a high standard and redecorated throughout. Available NOW and offered unfurnished call Frank Innes to view! Renovated throughout to a high standard!